When camels and carts were the only means of transport across deserts, camels had a significant role in trade. Caravans of camels were constantly passing through the regions of Sindh, Rajasthan, and Kachchh, carrying trade items like opium, silk, indigo, iron, ivory, dates, coconuts, perfumed wood, and dry fruits. Tangs were used to secure the many trading goods. The tang is a belt tied to one side of the wooden saddle on the camel, passes around the animal’s neck and under its tail, and is tied to the saddle on the other side. Since the wooden saddle is typically quite long, two tangs are used to secure it. The front belt is patterned, while the back belt is typically left unpatterned. Camel girths were extensively made and used throughout the areas of western Rajasthan and the salt plains of Kachchh. These regions have a rich pastoral culture, as herding has been a major livelihood for centuries. Maldhari pastoralists reared cows, buffaloes, camel, sheep, and goats. With hair from camels and goats, the Maldharis devised a unique braiding technique to make tangs called ply split. With ply split braiding, a plied rope is threaded in through itself. Vankars, a weaving community in Kachchh, also practiced the ply split technique to make rugs and camel saddle bags. “It touches my chest as it hangs from my shoulder to my heart while I braid my tang. After it is made, I tie it around the heart of my camel. So it ties my heart to the camel’s. The Rabaris Maldharis are one community of traditional camel, goat, and sheep herders who spun yarn out of camel and goat hair to make girths, decorations, and harnesses for their camels. Other herding communities in Kachchh, including the Jats, Mutwas, Samas, Sumras, and Sodha Rajputs, also made these girths. They would take ready made yarn from the goat herders and braid the girths themselves, or source the completed braid from the Rabaris or Vankars. The designs, braiding styles, yarn type, and motifs for ply split braiding depended on community preferences. Although Maldhari is an umbrella name for all pastoralists in Kachchh, there are a few cultural and ritual beliefs that vary among different communities of Hindu and Muslim herders. The Muslim Sindhi Maldharis, for example, preferred tangs with geometric patterns. Hindu Rabaris, meanwhile, enjoyed geometric designs but preferred bold figurative motifs. I belong to the Meghwar community. I have heard from my grandfather than our community came to Kachchh from Marwar in Rajasthan about 700 -800 years ago. So our craft practices and styles are very similar to that of Rajasthan. We used to weave dhabda, a traditional woolen Kachchhi men’s shawl, and kharad, rugs woven from camel and goat hair. Since we were living in a village close to Banni, a grassland where the majority of the pastoralists live and graze their cattle, we had a close relationship with the Maldharis who were our main clients. 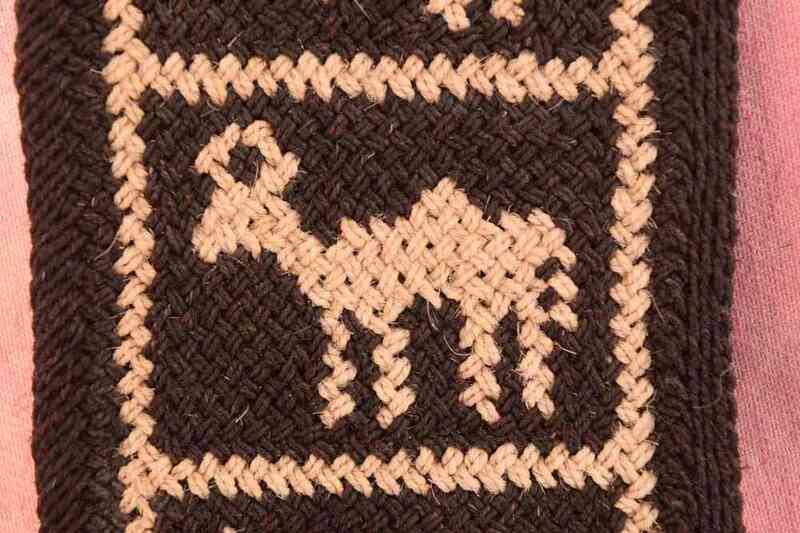 The Maldhari herders used to give us goat and camel hair that was spun and woven into shawls, rugs, camel saddle bags for storing grains and ghee. There were countless cattle that people used to herd in those times and we got enough animal hair for our weaving. Other than weaving on a loom, we would twist and braid goat hair to make accessories like tang, gaani (necklace), gorbandh (necklace), muaar (harness) for Maldharis. In return, they would reward us with grains, milk or cattle. My family also traces its roots to the region that is now Pakistan. When they arrive in Pachchham, West Kachchh, they adapted to the technique of the pastoralists of the area. I still practice these techniques and my products are bought by craft lovers. Tang making is no longer prevalent today as the Maldharis find it easier to use new materials for their needs. The use of camels for transporting goods has also reduced significantly. The technique of ply split braiding that was used in tang making has died out in its traditional form. Only one artisan in Kachchh still makes products in this technique, which are sold to craft lovers and tourists.